Height 5 feet 10½ inches. Weight 152 lbs. Chest measurement 34-36½ inches. Complexion fair. Eyes grey. Hair brown. Sight and hearing both good. Colour vision correct. Limbs well formed. Full and perfect movement of all joints. Chest well formed. Heart and lungs normal. No illnesses. Free from hernia, varicocele, varicose veins, haemorrhoids, inveterate or contagious skin disease. Vaccinated. Good bodily and mental health. No slight defects. No fits. Sydney Harold GIBSON, known as Syd to the family, was the youngest son of Joseph (Joe) and Margaret Ann (née Fox) Gibson, of Timaru. Born on 25 May 1895 at Timaru, he was baptised at St Mary’s Anglican Church, Timaru, on 11 August 1895, his mother being the sponsor. At this time his father was a hotelkeeper at Washdyke, before moving back into Timaru. He had applied for a licence for the Doncaster Hotel at Washdyke in 1894, transferring the licence in September 1895. He had previously kept well-known livery stables in Church Street and Beswick Street, and offered the services of his thoroughbred “Hollywood”. In 1891 he purchased a double brake able to “carry over 20 passengers with the utmost comfort”. Also in September 1895 Joseph Gibson offered for sale 32 head of racing and thoroughbred stock - geldings, fillies, mares and hacks. The following month he was offering the services of his thoroughbred stallion “Mariner”. In December 1895 Joseph Gibson, who had also engaged in farming, put up for sale sheep and cattle. It appears that Margaret Ann Gibson may have been possessed of some land, in her own right, in the Arowhenua Survey District (1896). 1897 saw Joseph attempting to sell his properties in Church, Arthur and York streets, firstly by auction and then privately. A few months later Mrs Gibson wrote to the Levels County Council that a portion of what was to be Arthur Street belonged to her and she wanted to be paid for it, but apparently she had no title. In January 1899 Joseph claimed no responsibility for his wife’s debts from that date. A few months later he appears to have become the local manager of a debt collecting agency for a short time. Along with his siblings Sydney attended Timaru Main School. Sydney’s parents divorced in 1907. Margaret Gibson had obtained a separation order in February 1899, when Joseph left his wife to live with another woman. He admitted desertion and was living in Sydney when a summons was served on him in 1906. Thereafter Margaret Ann Gibson worked to maintain herself and her five children. Like a number of young men of the time, Sydney incurred a fine (10 shillings) for riding a bicycle without a light. That must have occurred about the time he left Timaru for Trentham. Sydney left Timaru on 15 December 1915 for Trentham, to join the 11th Reinforcements. Living at home (117 Church Street, Timaru) with his mother, he was employed as a draper for T. & J. Thompson, Timaru. He enlisted on 5 April 1916, aged 20 years 10 months, and had previously served for two years with the Army Service Corps, Timaru. Sydney was single, of Church of England adherence, and in good health, 5 feet 10½ inches tall and 152 pounds in weight. He was initially rejected on account of hernia, but had this operated on. He nominated his mother, Mrs M. A. Gibson, 117 Church Street, Timaru, as his next-of-kin. His father’s whereabouts was not known. The common misdemeanour was recorded against his name while at Featherston – overstaying leave, for which he forfeited 3 days pay. This followed a bout of influenza at Featherston. 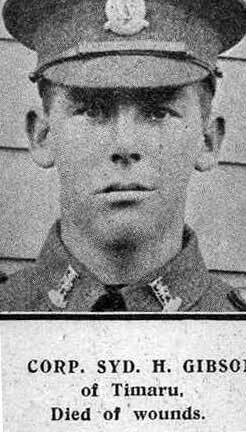 Rifleman Gibson embarked with the 6th Reinforcements, NZ Rifle Brigade on 26 July 1916, destined for Devonport. On 3 October he disembarked and marched into Sling Camp and just 17 days later he proceeded overseas, where he joined his battalion at Rouen. He was penalised for another offence – this time in the field on 16 February 1917, when he paraded unshaven after being specially warned. For this he was confined to barracks for 2 days and deprived of 1 days pay. In April 1917 he was detached to a Working Battalion for a month. In June 1917 he was appointed lance-corporal, a month later appointed temporary corporal in place of a wounded soldier, and promoted to corporal on 28 August. Corporal Sydney Harold Gibson, 15803, with the New Zealand Rifle Brigade, died on 18 October 1917 of wounds received in action in France, aged 22 years. He had suffered a gunshot wound to his thigh on 12 October and was admitted to the No. 1 New Zealand Field Ambulance. He died in the No. 3 Australian Casualty Clearing Station a day after his admission. His name appeared in yet another very long Casualty List, No. 706 issued on 1 November, along with those of some other South Canterbury men. He was the third of Mrs Gibson’s three sons to go on active service, his brothers Ernest and Herbert having embarked together, had been to the front and returned home by October 1917. A death notice in the Timaru Herald of 2 November 1917 recorded “He has done his duty.” Mrs M. A. Gibson and Family inserted a notice on 20 November, sincerely thanking all kind friends for their messages of sympathy in the loss of their son and brother “somewhere in France”. For some years after the family continued to remember Sydney H. Gibson in brief yet touching messages – “So loved, so mourned.” “To memory ever dear.” He was buried in the Nine Elms British Cemetery. Poperinge, West-Vlaanderen, Belgium, by the Rev. E. G. Muschamp on the day of his death. He is honoured on the Timaru Memorial Wall and maybe on the St Mary’s Church, Timaru, Memorial (S. Gibson). The plaque and scroll were sent to his mother in 1921, and his medals – British War Medal and Victory Medal – in 1923. At the Timaru Main School committee meeting of 28 November 1917, the headmaster reported, with regret, that five old boys had been killed in action – one of them being Sydney Gibson. Sydney was remembered again at the Timaru Main School, when the chairman at the annual meeting on 22 April 1918 proposed a vote of sympathy with the parents and relatives of ex-pupils who had fallen in the war. This was carried by silent vote, all present standing. Margaret Ann Gibson died in 1933, after a hard life and great loss, and is buried in the Timaru Cemetery. Her main inheritance came from the estate of J. B. Fox, most probably her brother. What became of Joseph is unknown. His brothers and sisters remained in the Canterbury district.